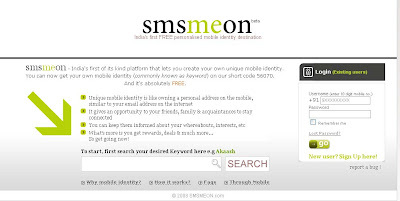 SMSMEON is a website that introduces an sms platform over which you can multicast information to requested mobile users over a shortcode 56070 for free.You can create a keyword for free.It becomes your mobile identity.You can create more than ten sub keywords that need to be used along with the main keyword. SMSMEON can be used via the internet through the web interface or through mobile.In the internet you register at SMSMEON and select a username of your choice and availablity named say "Abijath".Now you can set a message at that site which would be sent as sms to users sending the sms with text abijath to 56070.Now the users will be charged at good rates.You can update the data whenever you wish to. Using SMSEON through mobile costs you for the sms. It is free.You get a keyword over the shortcode 56070. Can use for family and friends networking. Only one gaining is the smsmeon owner and the mobile network operators.It costs your subscribers good money to send smses with your keyword on the shortcode. Most of the people are not going to like this concept. You just have to click the image below and fill up a form on the page. They will send you a code for verification purpose on your mobile phone. Enter the confidential code after logging with the registration username and password on the smsmeon website.